Aaahhh..yes so much better. 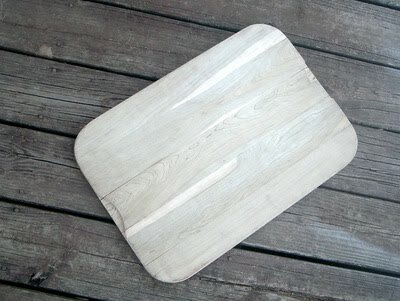 I found this large wood cutting board at goodwill for $2.99…hello cheap AND sturdy! I actually use the “back” or the side without the knife marks. 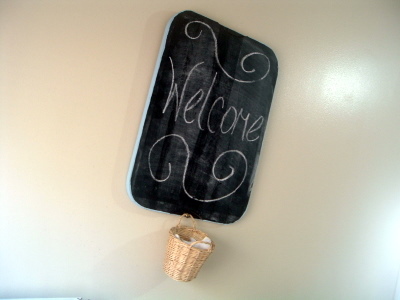 I just sprayed it with a few coats of chalkboard paint (always follow the instructions on your can!!). Painted the edges in robin’s egg blue. After the mandatory 24 hours I had a board for our weekly “schedule”. I put a saw tooth hanger on the back. A mini-basket attached to the front with an upholstery tack holds the chalk and a rag for an eraser. This idea came to me just in time…you see I have three kids playing ball right now…busy, busy, busy. OH my George! That stuff is SOOOO cute! Thanks for the chance! You know I’d sign up for any giveaway you’re having, cuz I know it would be great. And this is!!! Thanks for giving me a chance at such an awesome giveway!! Oooh, what a fun giveaway! pick me! pick me! I love their stuff, especially their pillows. What a great giveaway and congratulations! and this giveaway would be a great one to win! Love the pillows! So fun. Really?!?! WOW, CSN! I hope I win, there are so many things I’ve seen there that I would love to own! Thanks for this giveaway! I’m in! Thanks for the chance to win! Those pillows are so fun, would look great on my porch rocking chair! I love the pillows too. So cool! Thanks for the chance to win! Thanks so much! I love that you get to choose your own prize. Great giveaway. Have a super weekend! Such great stuff! Thanks for the chance! I am loving that little package of pillows…what fun colors. Thanks for the giveaway! I just placed an order with CSN and received it yesterday. They are a great company to deal with and do everything they can to make sure you’re satisfied. This is a great giveaway! Pick me, pick me, pick meeeeeeeeeeee! Love it! I want to WIN!!!!!!! Ok, gotta love a giveaway! Very cute site! I LOVE giveaways!! And what a fun one!!! I love your new finds this weekend!! Fun! I have a little crush on the Menu Pernille Vea Organic Vase at All Modern – that’s what I’d get, I think! How did I miss this earlier?! I would love a chance to win! I hope I get it!!! What cute stuff! You can count me in. Thanks for the great giveaway. Awesome giveaway! Drooling over the pillows. So cute!!! I’m loving it all!! This looks to be like a real neat giveaway! I’d love for my name to be added to your drawing! Thanks for having this neat giveaway! Love this giveaway… I could always shop for something I want! 🙂 Thanks for having this! Wow, they have such cute stuff. Enter me in your giveaway! Thanks! Count me in. Great store. Hey! I love thrifting, when I have time. You did real good with your loose change! This is my first visit to your blog, but I’ll be back! Thanks for the chance to win! I need pillows. Thanks, Angie. Everytime I read your blog….I am heading out the door to a yard sale…Home depot…thrift shops!! Re-doing rooms and decorating is my passion and YOU inspire me! Oooooo…I’d love to be included…awesome giveaway! What a beautiful blog you have and love all your craft ideas. Hmmm. You know, owls are the symbol for women writers, you know…but, gosh, I love everything here! Love the shower curtain hooks. Great idea! Count me in for the giveaway! Wow that is some cute stuff. I love CSN – so many choices for any decor style. 😉 Please count me in. Thanks! What a great store!!! I was checking out dishes just last night. Please pick me for your wonderful giveaway! I would love to win this gift cert. Your blog is really nice, I just discovered it recently! Love the Site and CSN Stuff! Great Blog! Love the site! So many nice things to make my house a home! Thank you! I would love to win. So much to choose from! Oh those pillows are adorable! What a great giveaway ! Thank you for this chance! Love this giveaway! Pick me! Pick me! I love the website, this would be so fun to spend! I love that entertainment center! I could really use a new end table for my living room too! I love that you get to pick your own prize! I just had a CSN giveaway on my site! How fun! I’d love to win! Please enter me! Leaving my commen for a chance at this great prize, thanks for hosting. I keep finding more things I want every time I visit CSN! How Fun! Please enter me. I’m crossing my fingers and toes you’ll pick me!!!!! Those pillows are just great! WHat a fun giveaway! What a nice blog you have, I am new to it! Have agreat day! I love those pillows! They are gorgeous! What a great giveaway! Count me in for the giveaway. 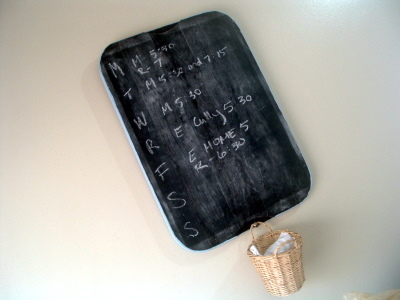 I’m a follower and love the chalkboard idea! Count me in! Holy, there are so many things to look at!!! Pick me! Pick me! I would love to win this giveaway! Love this giveaway! Love CSN! I have been on the allmodern.com website for like 20 minutes now…totally obsessed! Great Giveaway! Love that store, they’ve got EVERYTHING. oh, i hope i win. i really love those cute pillows. Fun! Thanks for introducing a new great site! Fingers are SO CROSSED right now! I love love love the pillows!! Those are the sweetest pillows and I could see them on my guest bed! CSN has great stuff. Those pillows are very cute. Selection, selection, selection. How would I ever choose?? Sign me up — and thanks for this very nice giveaway! What a great giveaway. I would love to win one of those fabulous pillows! Thanks for the chance. I am hearing about CSN stores everywhere all of a sudden. Maybe I’ll win the giveaway so I can see what all the buzz is about! Oh, this is a fabulous giveaway, I would love to be entered! Oooh, I could so easily find something to buy for $50 at CSN! Love them! Thanks for hosting the giveaway. I have one on my blog, now too. I’m a follower. I think I’d use it towards some toy storage. Oh! I just found this through The Shabby Chic Cottage link. Hope it’s not too late. (I’m on the West Coast, and I’m not sure how far ahead of us you are.) Anyway. Have a great weekend! Oooh…CSN has some really nice things! I’d just love to go shopping there! How sweet of you and CSN to do this giveaway for us! Okay…I’m crossin’ my fingers and toes…shoot, I’ll even cross my eyes if it’ll help! Hehe! Thank you sooo much!!! WoW! Those pillos are amazing! Thanks for the chance to win! What a fantastic giveaway. I too love the pillows.